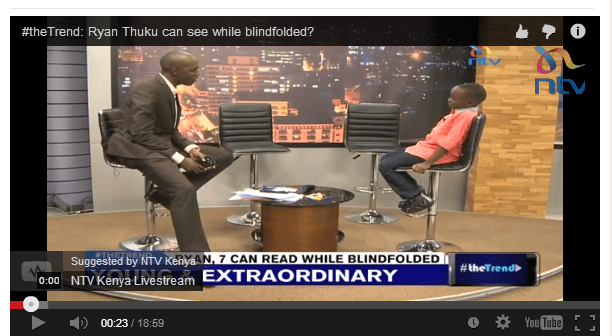 Last night NTV brought in the studio a 7 year old boy, Ryan, who is claimed to be able to see when blindfolded. To demonstrate this, Ryan was asked to put on his blindfold on and sort out pegs according to color. To confuse him, Larry Madowo remixed some of the pegs but Ryan was still able to identify the mix ups and return the pegs to their rightful groups. The second test involved letting Ryan read from a Camera prompter, first without the blindfold to be sure he knows where the screen is then he re-read the same script but now with the blindfold on. To convince the viewers that Ryan was indeed able to read from the prompter, he asked the Director to scroll down the screen to several sentences that Ryan allegedly had not seen before. Ryan’s mother and his trainer were then brought into the studio to provide insight on Ryan’s ability. Well, the mother simply explained that she discovered that Ryan had beyond his year’s wisdom and so she decided to take him to a brain training school. Ryan’s trainer explained that at young age kids tend to use both hemispheres of the brain but as people grow they tend to specialize in one hemisphere so losing the ability to use intuition when interacting with the world (claims this wikipedia article refutes). Lastly Ryan was tested to identify the color and numbers of poker cards shown to him and lastly Larry Madowo wrote “This show is great” on a piece of paper which Ryan was able to copy. But the question that a few have asked is whether Ryan indeed was able to see beyond the blindfold. I’m also a skeptic and so I decided to do a lot of online search to see if we have any scholarly works that explain this extra ordinary phenomenon. Before we delve into my findings, let’s first point out some facts about #theTrend and Ryan Thuku. First, Ryan Thuku had his own blindfolds. Second, he was never required to close his eyes to do his magic. Third, when reading at the prompter, he kept his eyes very high (you can verify from the YouTube posting by Larry Madomo linked to below). Fourth, when he was to read the cards, his mother gave him a different blindfold from the one he was having. Lastly, when copying Larry’s written words, he did it right below Larry’s, something that I have replicated by blindfolding myself but leaving a see through between the eyes and the nose. The see through requires one to look up when reading from text placed in front of the face, similar to what Ryan had to do when reading from the prompter. Here is Larry’s tweet with #theTrend video. You may watch keenly to identify the facts listed up there. There is a reason why the blindfold was specifically Ryan’s and almost black in color. I can only relate Ryan’s blindfold’s to this description, “The Blindfold has two settings- “clear view” and “no view”. You can actually let a spectator try and see through the blindfold- they can’t. But with a secret move, you can turn the clever cloth into a blindfold that you’ll be able to see right through. Yet your audience watching you will not be able to detect that you did anything to the blindfold- it will look perfectly normal and convincing to them” Magictricks.com. Larry Madowo bringing Ryan Thuku in the studio to prove that a kid can read through a blindfold is not the first in the world. In India, a young girl Ranjana Agarwal was taken to Live India TV Channel to demonstrate her abilities to see when blindfolded. The programme went on smoothly until Narendra Nayak, the article writer, suggested that he should place two pieces of sticking plaster at the gaps between the blindfold and her cheeks but suddenly Ranjana became sick (read the story here). Another test that has debunked claims of abilities to see beyond blindfolds was done by some skeptics and their finding posted on YouTube. So, if it is possible that Ryan can see through the blindfold, how should he demonstrate this beyond any reasonable doubt? Vietnam Breaking News ran an article of a woman who can see when blindfolded in November 2006. The criteria allegedly applied to verify the abilities of the woman should be applied on Ryan but now with scientists who want to write about the same under peer reviewed scientific journals present. If such an ability exists, then biotechnologists and genetic engineers should be interested to identify responsible genes if any. Maybe we can in the near future be able to give birth to children who have these extraordinary abilities through genetic engineering. Someone with ability to see when blindfolded should be able to see in total darkness, If No, why? Ryan should have been asked to close his eyes at one point, If No, why? Ryan should be asked to demonstrate his abilities in presence of public audience who volunteer to blindfold him the best they imagine of, If No, Why? By the way why couldn’t Ryan locate the prompter with his blindfold on? I thought the prompter is bigger than the script in the prompter?